This bariatric alternating pressure and low air loss mattress system is the elite among all of our twin mattress systems. The bariatric medical air plus mattress offers an accurate and adjustable pressure monitoring system that includes an advanced pump with a built in microprocessor. This processor monitors and maintains consistent pressure disbursement while stimulating blood flow and circulation. Each alternating cell inflates and deflates over an adjustable cycle time that protects the patient from pressure ulcers while healing existing bedsores. The med air plus system has a patented cell in cell configuration that provides additional support while preventing the patient from bottoming out. In addition to the alternating feature the Med Air Plus offers low air loss therapy in the trunk and pelvis area. This low air loss therapy allows the patient to remain cool and dry to help accelerate the healing process while preventing new bedsores and pressure ulcers from forming. 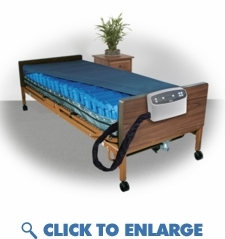 Adjustable Cycle times allows the patient to control how often the mattress alternates. 10 15 20 25 minute cycles can increase blood flow to various contact points allowing the patient to control pressure relief while adjusting for pain management. This alternating pressure mattress remains inflated for up to 24 hours in the event of a power outage. The mattress also has an additional 4� cell that remains inflated along the base of the mattress at all times to offer additional protection while the mattress is in an elevated position. Seat inflation feature increases air pressure to the trunk and pelvis area offering additional support when elevated. This mattress heals up to and including stage 4 pressure ulcers. ***Patented air tube connector is ideal for nursing home use. Protects the unit from damage to air cell ports. Pump can be used as static or alternating pressure device. � Ideal for use in nursing homes, hospitals and home use. � LED and Audible alarm activates when pressure falls below 10 mmHg. � Easy to replace individual bladders. � Cell-in-Cell design prevents the patient from bottoming on the bed in the event of power failure. � High volume pump produces 8 LPM of air. � Mattress has 20 air bladders, 9 with laser holes for low air. � 8" cells are constructed with Nylon/TPU that is soft, lightweight and will not stretch. � The zippered cover features a TPU material on the outside that is heavy weight and a Polyester material on the bottom that is lightweight and durable. The cover is water resistant, vapor permeable, has a fiber quilted bottom and is machine washable to provide protection and comfort. � CPR valve provides fast 20 second deflation.